Bobby is the easiest way to get insights in your fixed costs. 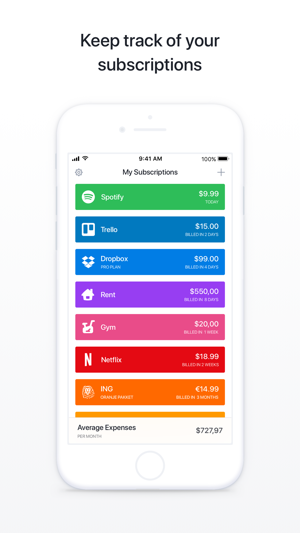 Manage your subscriptions and get notified when a bill is due. 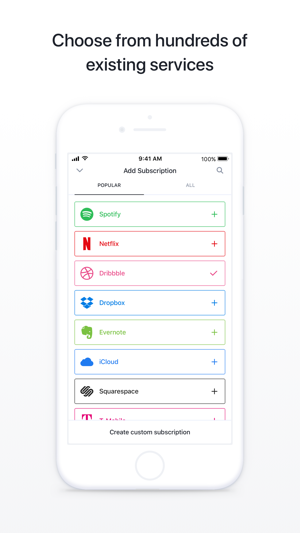 Adding subscriptions is easy, choose from hundreds of existing subscriptions or create your own custom subscriptions. Enter all contract details to get the most out of Bobby, or use Bobby as a quick way to calculate your monthly payment for you. Bobby provides a clear overview of all your subscriptions and upcoming bills. This way you'll always know the amount of money spent on subscriptions, which helps you to control your monthly spendings. Bobby also notifies you when a bill is due, so you'll never have to deal with late payment fees you didn't know about again. Besides that, it prevents you from having insufficient funds on your account on the day a payment is due. 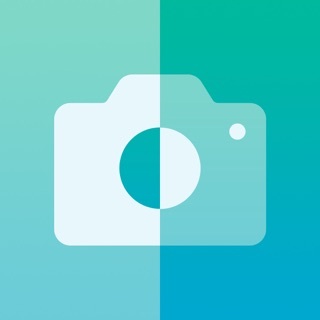 The app is great, and I purchased the all-in-one pack as soon as I noticed this app’s utility. 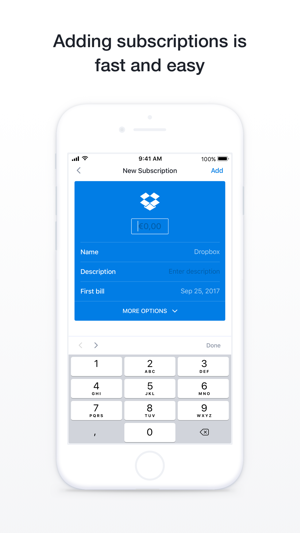 It’s really handy to have a central place to keep track of and see exactly where your money for subscriptions is going, as well as when and how much your next bill is going to be. 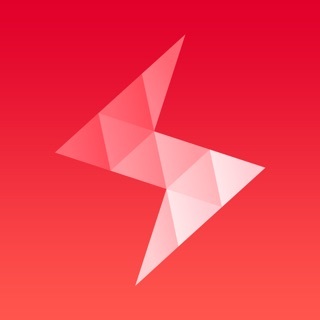 I personally have multiple subscriptions to array of different services, and I never really realized the amount of money I was spending on them, but this app aims to solve that problem. Input all of your current subscriptions, and then you can easily have an overview of everything in one place and even audit the subscriptions you no longer need. I applaud the developer for the work they’ve done and the frequent updates they release! It’s no joke that they’re improving the app and adding new features all the time. I highly recommend both the app and the in-app purchase—just give it a try already—you won’t be disappointed! Love this app! It’s *almost* everything I’ve been looking for in order to track upcoming expenses and bills. It’s clean, minimal, easy to use, has tons of built-in services to select from, but allows you to create your own custom ones as well. 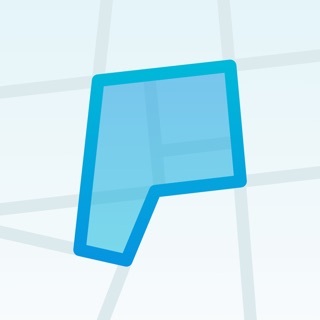 Just a few small suggestions that would make this app amazing. - Upon initially launching, allow a user to just select all the subscription services first. This would make setup so much faster than having to search each one out and set it up one at a time. I actually entered all of mine *blank* to begin with just to get them all selected, then went back in and configured each one. - Allow a preference to display the upcoming due date as either a relative span of time (2 weeks) or the actual date (Sept 15, 2018). Would much rather see the actual date. I actually used the Description field to simply add “3rd, 11th, 21st, 30th” etc to indicate the date of the month that expense is due on. - Add a Categories field. While I know the intent of the app is to track subscriptions, I’m actually using it to track expenses beyond that, including utilities, bills, etc., and I’d love to be able to put each expense into a category and view those lists either collectively, or separately. Again, love the app, highly recommend it! Would love to see just a few small tweaks which would make it much more useful. Simple to use that just plain gets the job done. 4 stars because there are a few features that could be enhanced as mentioned in other reviews but this was a solid addition overall to my financial management stable of apps. 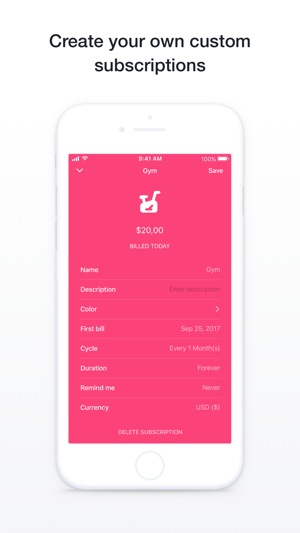 I use a different bill tracker app but this is perfect for those month to month or yearly subscriptions that we tend to forget about and keep renewing even though I mean to cancel them. 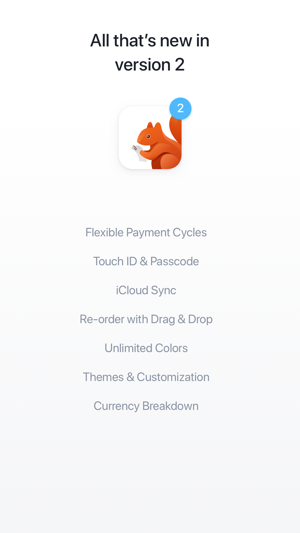 Have already saved 10 times the cost of the app by using to cancel renewals ON TIME and having one place to track the ridiculous amount I spend on subs and account for all that lost money. Awesome app thanks to the developer. Hope v2 coming soon will not mess it up too much.